Kirodimal Goverment Polytechnic Raigarh is affiliated to CSVTU Bhilai and approved by AICTE. This Institute bears the responsibility of full-filling the technical training needs for the upliftment of the community by offering suitable training, needed consultancies and other related services. 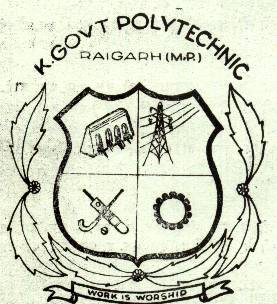 Kirodimal Govt Polytechnic Raigarh is the oldest state polytechnic of the undivided state of M.P. It has been providing valuable services to it’s stakeholders since it’s establishment year 1956-57. It was inaugurated by the first President Hon’ble Dr. Rajendra Prasad and since then it’s journey of progress has set many milestones. Diploma holders from this institute have been getting placement at state and national level organizations on prestigious positions. At present, there are six branches of Diploma Engineering available here—Civil, Mechanical, Electrical, Computer Sc & Engg., Electronics & Telecommunication Engg. And Metallurgical Engg. Part-time diploma courses in Civil, Mechanical & Electrical Engg have also been started from the session 2008-09 to cater to the needs of neighboring industries and their employees. Kirodimal Goverment Polytechnic, Raigarh offers various graduate courses as well as Post Graduate courses. Kirodimal Goverment Polytechnic, Raigarh is affiliated to Chhattisgarh Swami Vivekananda Technical University, Bhilai. List of facilities available at Kirodimal Goverment Polytechnic, Raigarh for students.